The impact of large animal and vehicular collisions on US roadways is profound. Each year there are approximately 750,000-1,500,000 vehicular collisions with large animals accounting for over a billion dollars in property damage annually. In addition to property damage, there are also costs associated with removing vehicles and animals from the roadway and over 200 deaths occur annually as a result. Thankfully, Category 11 of the Transportation Enhancement program was designed specifically to reduce this conflict between driver and animal. The 25 mile long highway 89 in California runs through Tahoe National Forest offering beautiful views of conifer forests and snowcapped peaks. The highway intersects the natural migration route of Loyalton-Truckee mule deer herd which has led to high collisions rates. 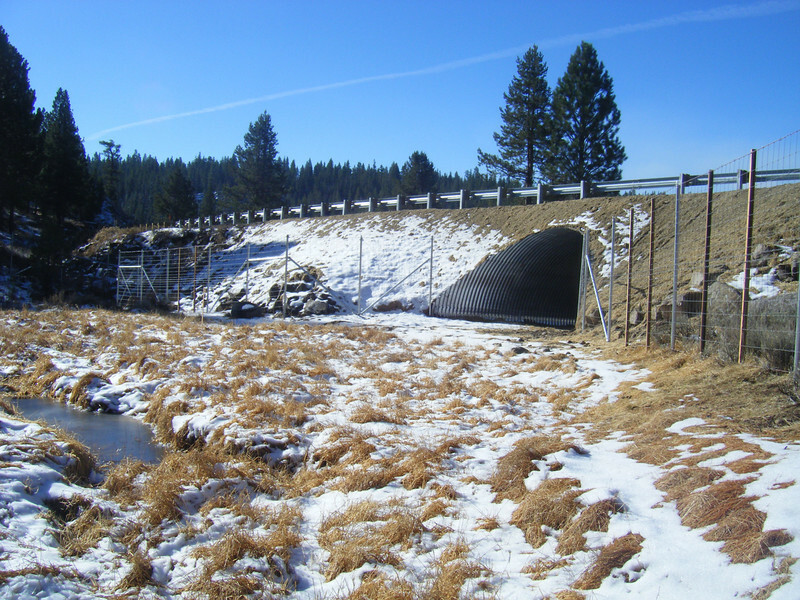 As a result of this, in 2003 a number of state, local, and federal workers, professors, and representatives joined forces to create the Highway 89 Stewardship team to find a solution. Thankfully for the team, CalTrans has maintained a database of where dead deer were removed from roads since 1979. They discovered that around 32 deer were removed each year from the highway. Using gps tracking collars, the Highway 89 Stewardship team was able to determine where deer were crossing the highway in the largest numbers. $599,000 in Transportation Enhancement funding was matched with $77,000 to fund the wildlife underpass which opened in June of 2009. You can hear US Forest Service Wildlife Biologist Sandra Jacobson discuss the impact of transportation ecology here. Also, here is a link to a video of the opening dedication.